My Dear Janay. I hope your fairytale works out in the end for you. I tell you, after seeing this small part of the interview, I don't blame Janay, I question those around her whom would pretend as if this sort of behavior so gruesome, whether by "mistake" or not, should be advocated. 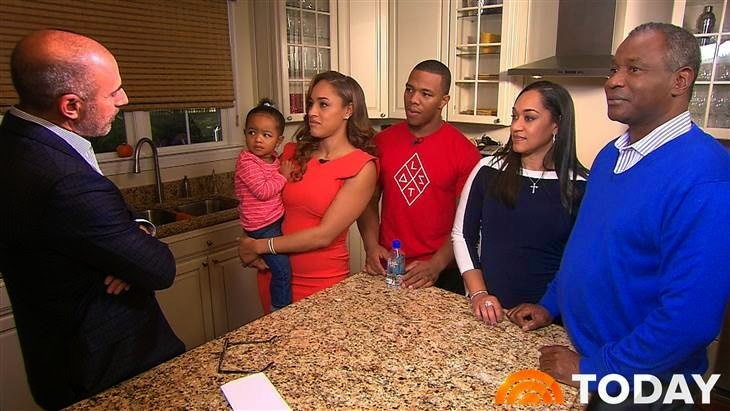 What I find interesting is how Janay's mother and she point a finger at media instead of pointing most of those fingers at the real perpetrator which is Ray Rice. My mother once told me, once a man hits you, he will do it again. To me it seems as if this is the sort of family who lives for appearances. What also strikes me is how Janay cries while trying to put on a brave front with smiles. We love you Janay. Stay Safe! We pray Ray Rice is receiving some kind of counseling on how to control his impulses, we would hate to see him use this sort of violence on others that he claim to love. Matt Lauer: You have remained silent. Has it been hard not to speak out about this? Lauer: I guess it was about four days or so after the incident at the casino that the tape, the first tape, came out, the one that was taken outside the elevator. Had you seen the tape? Rice: I saw the first one. Lauer: So did you see it before it was released to the public? Rice: No. We just knew about it. Lauer: Were you dreading the moment that that tape came out? Lauer: Have you seen the second tape? Rice: No. I refuse. I refuse. I'm not going to let the public bring me back there. Lauer: So me just ask you directly and bluntly. Prior to what we have now seen in that elevator was there ever any incident of violence in your relationship with Ray or has there been any incident of violence since that elevator incident. Rice: No Candy Palmer: No Rice: No. Not at all. Ray knows me. And there's no way. He knows what he would have to deal with, you know, if this was something. You know, I'm not going to sit there in silence and let something happen to me — and God forbid, in front of my child, just like, let it happen? There's no way.